Is the face of your garage door fading, chipping, or rusting? Over time, harsh weather elements can really take their toll. 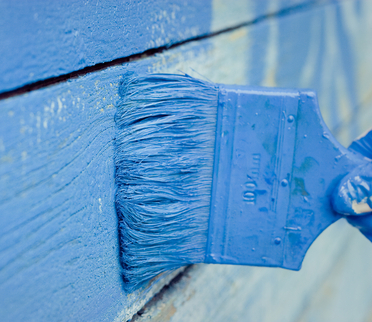 The good new is, you can make your garage door look new again with a fresh coat of paint. It’s a simple, inexpensive fix, but it can easily be bungled. So, below you’ll find some tips to re-paint your garage door. When planning your garage painting project, it’s crucial to choose a day when the weather will be dry and the family won’t be busy. For the paint to dry properly, you’ll need mild temperatures, no rain, and the ability to leave the garage door closed and untouched for at least 24 hours. Start early so you can get through it all before running out of daylight. This is probably the messiest part. But, if you want this new coat of paint to last you’ll need to prepare the surface well. Start by sanding off the layer of paint that’s peeling or chipping. If you have a metal door, inspect it for rust and sand that off as well. Any exposed metal should be sealed or primed to protect it from rusting again. Before you paint your door it must be spotless. So, get out your pressure washer (use a low setting) or your sponge, soap, and elbow grease. As you wash away all the dust and grime, pay special attention to the bottom part of the door since this is where so much of the dirt builds up. Make sure to thoroughly rinse away any detergent residue and let your door dry completely before moving to the next step. It’s always tempting to get to the fun part right away, but if you take a few minutes to prepare, the cleanup and finished product will be much more appealing. Protect your siding and trim by applying some painters tape around your door. Then, slip some plastic, cardboard, or a tarp under the door to protect your driveway and garage floor from spray, drips, and spills. First, if you’re painting over a dark color you’re going to need a coat of primer. Make sure the paint and primer you use is made for outdoor use. We recommend latex-based paint products as they tend to hold up best. Apply the paint in thin layers and let each coat dry before starting the next. Use a roller or sprayer for overall coverage and a small brush for edges and details. Then, remember not to open your garage for 24 hours after painting to allow for a flawless finish. If your garage door needs more than a facelift, contact Ponderosa today for a repair or replacement! Call (503)-730-0444 or use our contact form to send us an email.